Be the first to share your favorite memory, photo or story of Earlyn. This memorial page is dedicated for family, friends and future generations to celebrate the life of their loved one. WHITE, Earlyn - Age 84, of Linden, formerly of Fenton, passed away Wednesday, September 12, 2018. Private family services will be held at a later date. Arrangements provided by Sharp Funeral Homes, Fenton Chapel, 1000 Silver Lake Rd., Fenton. Those desiring may make contributions to McLaren Hospice. Earlyn was born June 22, 1934 in Kansas City, MO, the daughter of Earl and Dayta (Smith) Latham. She had lived in the Fenton area since 1948. Earlyn was a 1952 graduate of Fenton High School. She married the love of her life, Harold White on October 19, 1953 in Angola, IN. 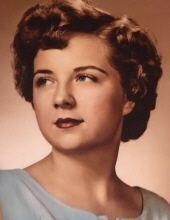 Earlyn was a devoted wife, loving mother and proud grandmother, who will always be remembered for her endless kindness, loving heart and thoughtful manner. Surviving are: her beloved husband of 64 years, Harold; 2 children, Bryan White of Ypsilanti and Naomi (David) Hodgkin of Grand Blanc; 4 grandchildren, Tyson, Randall, Mirren, and Madeleine. To send flowers or a remembrance gift to the family of Earlyn White, please visit our Tribute Store. "Email Address" would like to share the life celebration of Earlyn White. Click on the "link" to go to share a favorite memory or leave a condolence message for the family.